ISPU’s annual poll returns for a third year to measure the attitudes and policy preferences that impact the lives of American Muslims across faith communities, including results from Catholics, Protestants, Jews, white Evangelicals, and the non-affiliated. 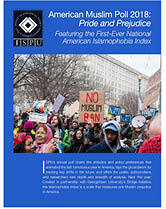 In American Muslim Poll 2018: Pride and Prejudice, we set out to measure the level of public anti-Muslim sentiment in its most impactful manifestations and, in collaboration with Georgetown's The Bridge Initiative, developed the first-ever annual Islamophobia Index (II). The report measures the Islamophobia Index among American Muslims, too, as well as the degree to which Muslims have accepted ideas of collective blame, shame, and alienation. This analysis also measures pride, joy, and confidence in one's faith identity across communities and how these sentiments are linked to civic engagement and national identity. Finally, this report explores the views of Muslim women. What, in reality, are American Muslim women's biggest challenges and fears? How do they feel about their faith and community? If they wear hijab, what are their reasons for doing so?